The “lots and lots of 9mm” vs. “a handful of big .45’s” debate is about as likely to be settled as Michael Moore speaking at the NRA 2014 Annual Meeting. While most discussion focuses on real-life pros and cons of a magazine full of 9mm ammo vs. seven or eight big and fat .45 ACP’s, I have an opportunity to consider the tradeoffs in a less threatening manner. Hmmm. Tough choice. Both pistols have compatible light and laser features. This August, I’ll be shooting in the Crimson Trace Midnight 3 Gun Invitational competition and I need to start thinking about equipment choices. The only constraint I am placing on my decision is the use of Crimson Trace only light and laser gear. Other than that, I’m open to possibilities. I’m competing in the Range Officer and Media pre-event, so my decision on gear won’t have any impact on the big prize potential. I’m not that fast anyway. So I’m looking at this event as an opportunity to explore viable options for home defense setups and get some dead-of-night practice with light and laser equipped pistols, rifles and shotguns. During the actual competition, I’ll be free to cover the real competitors and report on their gear selections and match performance. 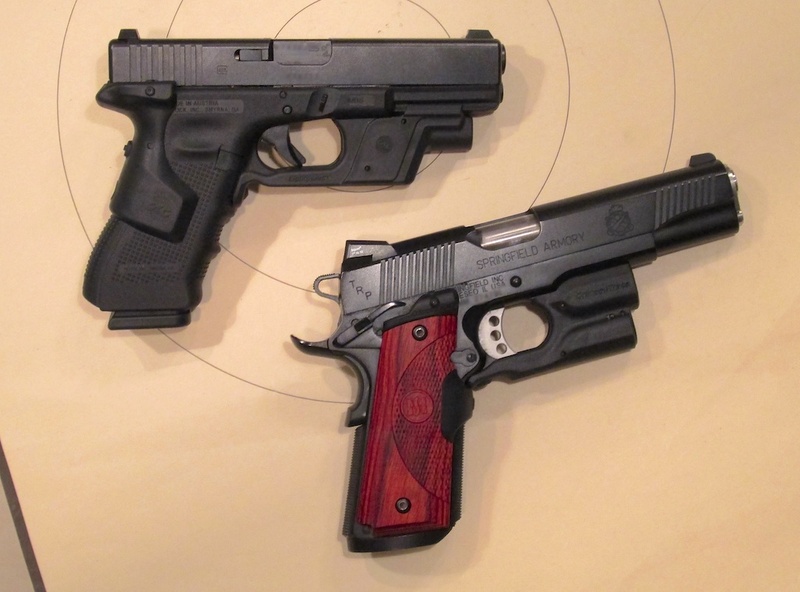 So far, I am strongly considering two handgun options. There’s a third possibility, but it’s a little bit silly. Fun, and certainly dramatic, but silly. I admit it. Does it make sense for 3 Gun? Not really, but it’s SO sweet! This is a high-quality .45 ACP 1911 – we reviewed it a while back and found it to be lacking, well, nothing. With standard factory magazines, it offers 7+1 capacity. Granted, that’s not ideal for the high round count sport of 3 gun shooting. 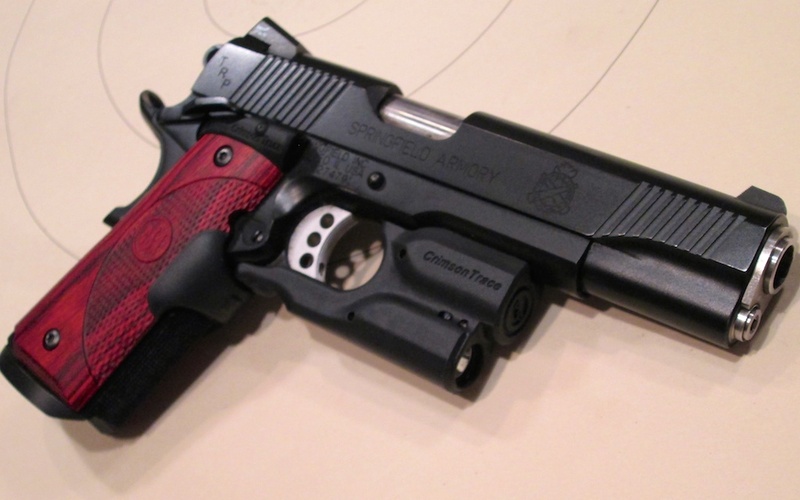 This gun also features the Crimson Trace LTG-701 Lightguard for 1911 pistols. While also front-activated, the button is on the underside of the trigger guard. This means that it’s compatible with the Lasergrips. The bottom of your middle finger activates the laser while the side of the same finger activates the light. Nifty. While I would be severely handicapped by necessity of more frequent magazine changes, isn’t there some benefit to the really satisfying sound that .45 bullets will make hitting those steel targets? And of course, the holes in the paper targets will be impressively large compared to those wimpy 9mm perforations made by my competitors. The safe choice? 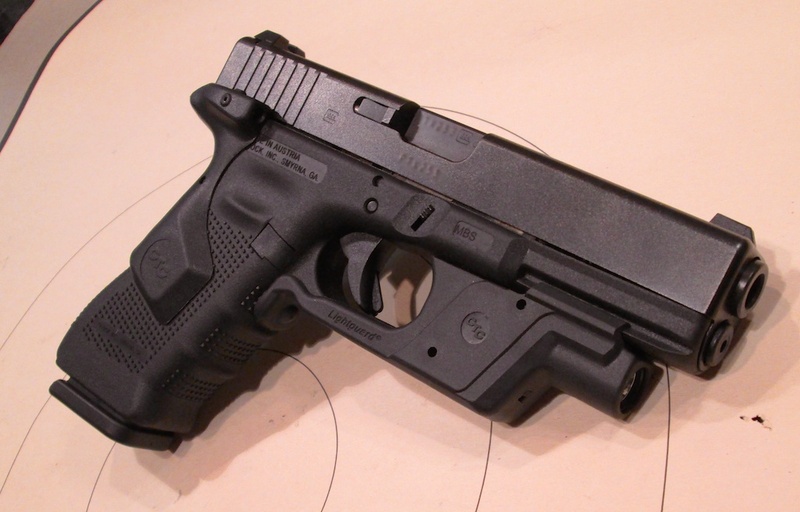 A Glock Gen 4 with Crimson Trace light and laser? This one is the safe option. A 17+1 standard magazine capacity, means hardly any, if any magazine changes. I guess that depends on my panic under the clock miss-rate performance though. I’ve got the Glock 17 Gen 4 configured with a Crimson Trace Lightguard and Crimson Trace LG-850 rear-activated laser. As the Lightguard is front-activated and the Lasergrip rear-activated, these two components are made to work together. Clearly this is the safe choice. Even now, 9mm ammo is available and (relatively) cheap compared to the other options. Capacity is grande and recoil is minimal so even a moderate shooter like me can do fast follow-up shots. As the steel targets just need to “clang” and not get knocked over, so 9mm has plenty of oomph. Ok, this option really makes no sense at all, as it has less capacity than the Glock 17 9mm and a lot more recoil to manage. I just have a fetish with the .357 Sig cartridge for some unexplainable reason. And it’s my nightstand gun. Remember when I said earlier that one of the goals was to run some realistic home defense gear through the match course? Although there is one potential benefit to shooting the Glock 31 with its .357 Sig cartridge. The gigantic fireballs and muzzle flash just might temporarily blind the other competitors, allowing me to coast to an un-contested victory. Here’s hoping. Given my goals for the match, what say you? I am a competitive cuss, so I’d go with the gun that gives me the best chance to win, the Glock 17. That being said, given your goals and the fact that your Glock 31 is your HD gun you should use that with the defensive load that you keep in it at home. You may learn something that only experience can teach about your home defense setup.